We love Tierra Cast! They are a great US company with high-quality cast metal products and an eye for cutting-edge design. Their charms match our chain finishes beautifully. 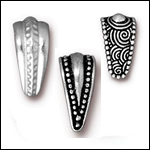 All Tierra Cast products are made of high quality pewter in the USA. They are lead free and comply with the European REACH standards. 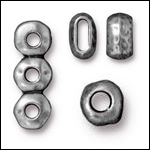 TierraCast jewelry components includes beads, charms, pewter charms, leather centerpieces, jewelry and garment buttons, leather cord spacer beads, and jewelry bails!